The name ‘Celts’ (pronounced ‘kelts’) is used to describe all of the people who lived in Britain and northwest Europe during the Iron Age – from 600 BC to 43 AD, which is when the Romans arrived. The Celts were a very advanced society. For instance, they learned how to make weapons from iron, which is why we call the time they lived in the “Iron Age”. In Britain, the Celts settled in areas such as Cornwall and Wales. 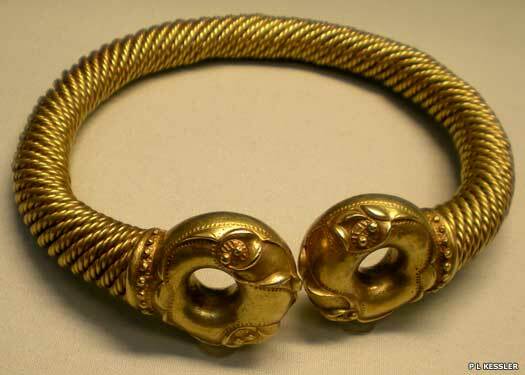 The Celts lived during the Iron Age, from about 600 BC to 43 AD. This is the time when iron was discovered and used. The Iron Age ended when the Romans invaded Britain and set up their own civilisation and government. The people who lived in Britain during the Iron Age weren’t called ‘Celts’ until the 1700s. The name is used to describe all the different tribes that lived in Britain then. There were three main branches of Celts in Europe – Brythonic, Gaulic and Gaelic. Brythonic Celts (Britons) settled in England. The Celts who settled in England were split into many different tribes, each ruled by a king or queen. The Celts believed in many different gods who affected every part of everyday life. Druids, who were priests in Celtic society, tried to figure out what the gods wanted. Men and women in Celtic times usually wore long tunics with different accessories, such as coats, capes or belts. 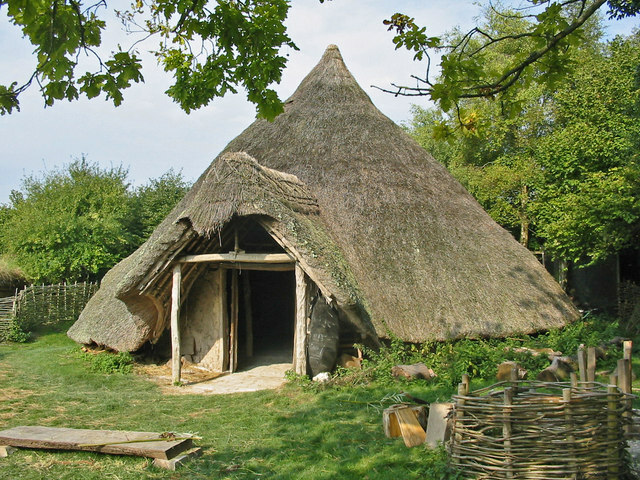 Most Celts were farmers, and they lived in houses that were round instead of square. In battle, Celts mainly fought with swords and spears, and they used long shields to protect themselves. Some people can still speak Celtic languages such as Welsh and Gaelic. 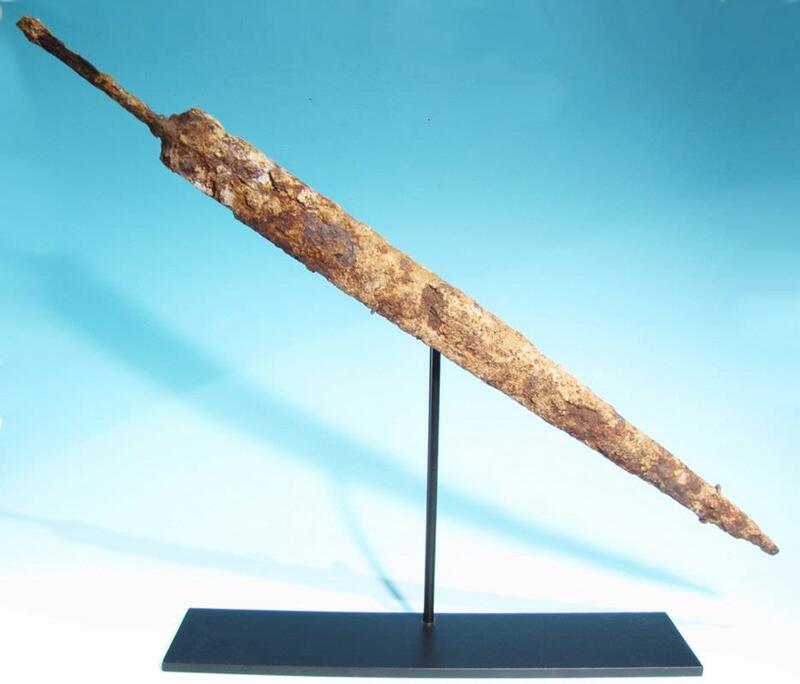 The Iron Age is named for the fact that people first started using iron to make weapons and tools. Before this, they’d have used bronze. The Celts wore brightly coloured clothing, and made fabric dyes from berries, plants and even seaweed. Dyeing was something that only women could do – it was considered bad luck to dye cloth if a man was around! The Celts lived in round houses with thatched roofs – they were made in the shape of circles, rather than with four walls. Many Celts were farmers, so they grew their own food and learned where they could gather nuts, berries and honey around their village. The Celts also kept their own cows, chickens and other livestock – sometimes the animals would come into their homes at night, as they didn’t have their own stable. Groups of houses built on top of hills were called hill forts – people living there could see if any enemies were coming just by looking out over the valleys, and could build strong walls around their hill to help defend it. Some people can still speak languages that the Celts spoke, Welsh and Gaelic. Can you spot the following in the gallery below? The body of an Iron Age Celt was found in a bog in Cheshire in 1984. He is called the Lindow Man, and could have died as part of a sacrifice to the gods worshipped at that time. In Celtic society, people could tell how wealthy you were just by looking down at your feet. Shoes would have taken a lot of time and skill to make, so only higher class people would be able to afford them. Celtic women usually wore two types of garments called the léine (a long tunic) and the brat (a cloak). Celtic men also wore léines and brats, but they’d also sometimes wear an inar (a jacket) over truis (trousers or shorts). While you often hear about people in past times not taking very good care of themselves, the Celts liked to stay clean, smelling nice, and make an effort with their appearance. Archaeologists have found beautiful jewellery such as torc necklaces, razor blades for shaving, combs and hair accessories that tell us about what sorts of things the Celts would have used. Celtic priests were called Druids, and the Celts believed that they understood nature and the world around them so well that they predict the future from it. Druids also acted as judges in Celtic society, and even doctors; they knew a lot about the healing properties of plants, and which ones would help someone feel better if they were ill or hurt. The Celts believed that there were gods for every part of life, and that the Druids were the ones who understood how to speak to them and interpret what they wanted. If there was a battle in Celtic times, anyone could be asked to fight – women as well as men. Celts used iron spears and swords, and they also carried long shields made from wood or iron. Some Celtic tribes would use blue paint to draw designs on their skin before going to battle. A famous Celt is Warrior Queen Boudicca, who led an uprising against the Romans when they invaded Britain. Histories think that she poisoned herself when her soldiers were losing, and the Romans were about to take them prisoner. There are some wonderful BBC video clips about different aspects of Celtic life: find out about Celtic bards and the poetry they recited, Celtic jewellery, Celtic artefacts, Celtic statues, everyday Celtic objects, Celtic water gods, Celtic religion, Celtic clothing, Celtic funerals, Celtic burial rites and Celtic burial chambers. Watch video clips to understand what a Celtic village looked like, how people lived in Celtic villages, Celtic roundhouse design, dwellings in a Celtic town and brochs, Celtic houses in the area which was formerly occupied by Picts and is now Scotland. An excavation at Chysauster, site of a Celtic village in south western Cornwall, shows what the ruins of roundhouses look like today. What did the Celts look like? Find out more about the reconstruction of a Celtic warrior's body found at Lindow Moss in Cheshire, famously known as the Lindow Man. His last meal was also analysed to understand more about his diet!